VAIL — Name a Disney movie between 1985 and 2005, and chances are Ellen Woodbury worked on it. Here are a few: “Aladdin”, “The Little Mermaid”, “The Lion King”, and “Beauty and the Beast”. Woodbury spent her career bringing the stories that shaped many childhoods to life. As a directing animator at the company that brought us The Magic Kingdom, Mickey Mouse and more, Woodbury’s career is marked with highlights and prestige. This weekend, she is meeting collectors while showing a collection of her sculptures at the Art on a Whim Gallery in Vail Village. For this, and many other significant achievements, Woodbury is regarded as one of the 50 Most Influential Disney Animators. Today, she spends her time in Loveland creating classic and contemporary stone sculptures from precious stones found throughout the world. Woodbury turned to stone sculpting in 2005, having resigned from her position at Disney in order to pursue a career as an independent artist. Long before, her path in education took her to the film program at Syracuse University, which she credits for teaching her how to analyze and for opening her mind. In 1982, Woodbury enrolled at The California Institute of the Arts. Here, she became the prized pupil of master animator and artist Jules Engel. With her background in animation well established at this point, Engel pushed Woodbury to another level. The combination of Engel’s influence and Disney’s wondrous and innocent characters are ever present in each of Woodbury’s one-of-a-kind sculptures. She is an artist who is not afraid to strike out on her own, drawing upon her extensive training while spending hundreds of hours painstakingly creating each unique sculpture. Soft curves, crisp edges and changes in shape highlight the piece. The sculpture is created from Sivec Marble, which was quarried in Greece. It is the same stone used in ancient Greek temples, plazas and statues. The marble is pristine, with medium sized crystals resembling the snow the famed ptarmigans are so adept at blending into. Amongst a collection of 10 original pieces, Woodbury’s show stopper is titled “Phoenix Rising”. The sculpture is inspired by hope and new beginnings. 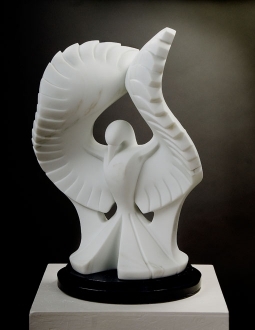 The piece is made from Yule Marble, which was quarried in Marble, CO. From the base to the tip of the Phoenix’ taller wing the piece measures 30-inches high. Light plays off of the smooth sculpted surface, as the piece is designed by using a combination of curved and faceted lines. Crystals found within the ancient stone sparkle like snowflakes when they catch the light. The piece held up to 623 hours of rigorous sculpting while being formed thanks to the strong bedding plane of the stone Woodbury chose. Both tips of the bird’s wings delicately curve outwards, giving the piece the feeling of flight and reaching for the next step in life. Woodbury’s current show at the Art on a Whim gallery (now called Raitman Art Gallery) represents well over a year’s worth of work. 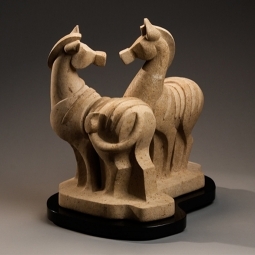 Given her preferred medium of stone, each piece is truly unique and is not created in editions. Woodbury will be wet-sanding a new piece while talking about her background and techniques in the gallery throughout the weekend. 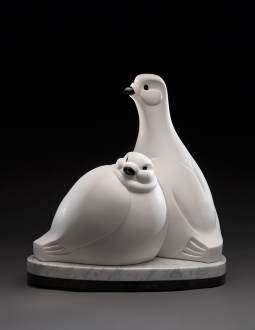 Who: Sculptor Ellen Woodbury presents sculptures in precious stone. Artist talks and demonstrations scheduled. When: Friday from 4 to 8 p.m. and Saturday from noon to 6 p.m.
Where: The Art on a Whim Gallery (now known as Raitman Art Gallery), 227 Bridge St., Vail.